- It is 4 inches long and is calibrated at 84 degree F to 29 degree Celsius. Usage/Application: The usage of these products is widely in various dairy outlets and factories. 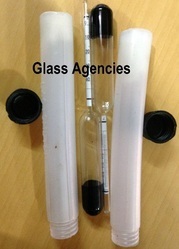 Dolphin® instruments is one of the leading preparer and s.
This is an instrument used to determine the richness of milk. Lactometer indirectly measures the cream content of milk. ... A Lactometer is a little glass instruments that tests the purity of milk based on density/buoyancy and works on the principle of the specific gravity of milk. We are remarkable entity, engaged in offering superior quality Laboratory Lactometers. 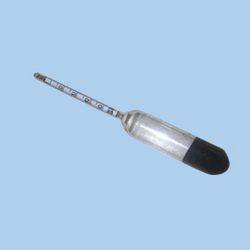 We are engaged in the manufacturing of lactometers Dic125 products. It is available in a range of different specifications like 6 inches in length; it has a paper scale range up to 1.000 degree to -1.040 degree and has a calibration power of 60 degree F to 15.5 degree Celsius also known as Zeal type lactometer. We are among the celebrated names in the industry for Trader and supplyer of Milk Lactometer. The offered device is highly demanded in milk testing laboratories for measuring the concentration of lactose in milk. It is light in weight, accurate and requires low maintenance.